We were delighted to be invited back to sing at the the Royal Hospital this October. The Friends of the Royal Hospital Donnybrook do vital work in support of this publicly-funded inpatient rehabilitation facility. A hard-working team of volunteer fundraisers are determined to make a real impact on patient care and well-being; Their contributions range from state-of-the art rehab equipment to raised beds in the garden, a new coffee shop and extra ambulances. We well know the value of these things to patients and their families. Around 24 of our medical musicians joined Music Director Brian MacKay to participate in their Music Evening in the, now familiar, beautiful concert hall that sits in the heart of the hospital. We shared the bill with the Dublin Ukulele Convention and historian Jane Beattie. 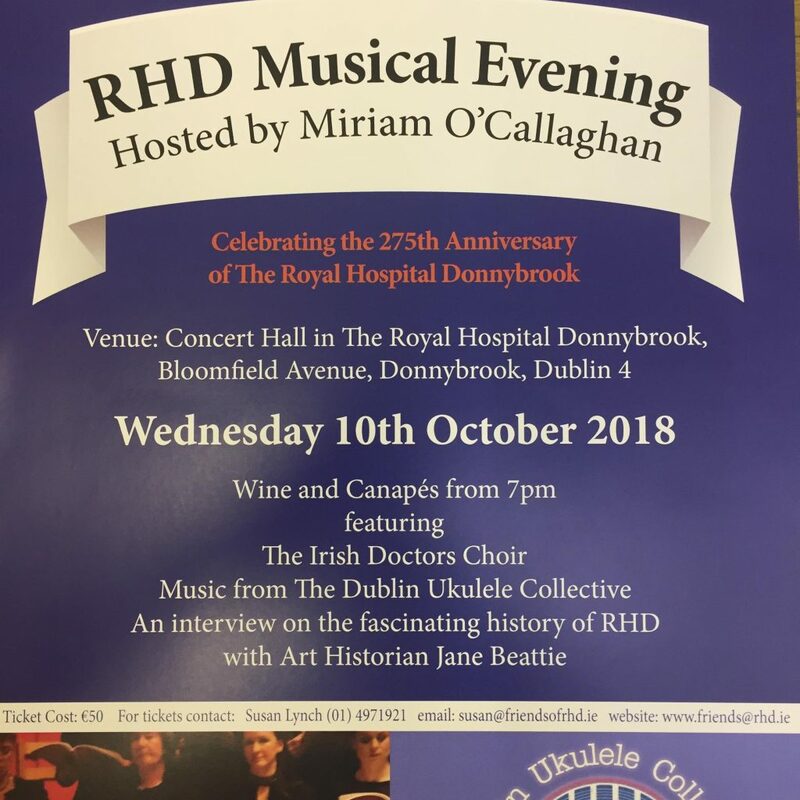 Alas, we were backstage and missed DUC’s contribution, but we were able to listen to Jane’s fascinating insights into the history of the hospital; as a Belfast person myself with shamefully little knowledge of historic Dublin, it painted a surprising and interesting picture. The challenge of performing with minimal rehearsal time together is enormous but we stood ‘shoulder to shoulder’ metaphorically as well as literally. We opened from around the hall with a set of canons, Dona Nobis Pacem and William Boyce’s Alleluia, before taking the stage to sing Tchaikovsky’s Cherubic Hymn ( No 1 from 9 sacred pieces). This acapella setting of words from the Russian Orthodox liturgy is searingly beautiful and it spoke straight to the heart. Samuel Barber’s fine song, Sure on this Shining Night followed. Afterwards, it was time to lighten the mood with Josquin’s El Grillo, a fun ‘frotolle‘ in praise of a singing cricket that was first published in 1505. We bravely stayed with the animals for IDC’s first, but surely not last, rendering of Contraponto Bestiale Alla Mente. This too is a very early piece and it stretched our limited animal impersonating abilities to infinity and beyond. A bit of sun- drenched relaxation with Hamba Nathi followed before moving straight into Palistrina’s Sicut Cervus. This well known gem of the Renaissance is a total joy to sing, although it’s clean lines place big demands on technique and phrasing. We finished our set with some beautifully-arranged Irish songs sung in unison. It’s time to mention our fabulous accompanist, Gareth Lewis, who encountered major traffic delays in his journey from Antrim Hospital and only made it to RHD with minutes to spare. Respect to you Gareth! We all sang Down by the Sally Gardens, then the women sang The Water is Wide. Anne Marie Liddy stepped out in front of the choir and gave a captivating rendition of Lagan Love with exquisite ornamentation and timing. – you had to be there! And yes, it was The Derry Air* to finish. The capacity audience of 150 joined us as we sang, inevitably moving in this setting. There was so much to learn from this event. A number of IDC members remarked on the uplifting and positive atmosphere in the hospital. We could not have been welcomed more warmly and we felt that patients and their wellbeing were truly at the centre of everything that they do there. Our thanks to the Royal. We were inspired by what you have achieved together. *If you are a choir member you will hopefully have recognised all these pieces taken from our core repertoire. Brian hopes to arrange some learning days for us all to work on our music for concerts. We will tell you more about that soon.